Pericope is a Greek word meaning a selection of verses that form a coherent unit or thought. In other words a pericope is a passage. The Pericope Adulterae is a fancy Latin way of referring to the familiar passage in John 7:53-8:11 in which Jesus confronts a group of men intent on stoning a woman caught committing adultery. 53 Then they all went home, 1 but Jesus went to the Mount of Olives. 2 At dawn he appeared again in the temple courts, where all the people gathered around him, and he sat down to teach them.3 The teachers of the law and the Pharisees brought in a woman caught in adultery. They made her stand before the group4 and said to Jesus, “Teacher, this woman was caught in the act of adultery.5 In the Law Moses commanded us to stone such women.Now what do you say?”6 They were using this question as a trap,in order to have a basis for accusing him. But Jesus bent down and started to write on the ground with his finger.7 When they kept on questioning him, he straightened up and said to them, “Let any one of you who is without sin be the first to throw a stoneat her.”8 Again he stooped down and wrote on the ground. The reason that the Pericope Adulterae gets a a Latin title is that many scholars and textual critics believe that this passage is a later addition to the Gospel of John. The vocabulary does not seem to be Johannine and many of the earliest Greek manuscripts do not have this passage, although the Latin manuscripts contain it and there some writings from the early Church Fathers which refer to the story. A few manuscripts have the Pericope Adulterae in the Gospel of Luke. It seems to be a better fit there with Luke’s special concern for the outcast and downtrodden. Despite the controversy concerning the Pericope Adulterae, no authority either ancient or modern questions whether it actually belongs somewhere in the Gospel and the ancient Fathers were unanimous in believing it to be a true story from the like of Jesus. No modern translation omits the passage although many place it in brackets to indicate the uncertainty about the passage. The creators of the Conservative Bible Project intend to omit the Pericope Adulterae because it is used by liberals. Increasingly many Christian churches, including the Catholic Church, are reciting, teaching and popularizing the Pericope de Adultera (Latin for “the passage of the adulterous woman”), set forth at from John 7:53-8:11. In the story a mob surrounds a woman to stone her for adultery, and ask Jesus what they should do. Jesus is describing as writing in the ground, and eventually beseeches those who have not sinned to cast the first stone. The crowd then disperses, beginning with the eldest first. 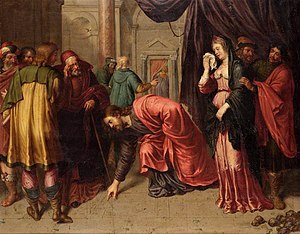 The movie The Passion of Christ includes flashbacks to a scene based on this passage; Bartleby’s quotations include its famous line, “Let him who is without sin cast the first stone”; and sermons are increasingly based on it. Arguments against the death penalty often cite this passage. Amid this scholarship, why is the emphasis on this passage increasing? The answer lies in its liberal message: do not criticize or punish immoral conduct unless you are perfect yourself. Liberals cite this passage to oppose the death penalty, a misuse that has been criticized. But one need not be perfect before he can recognize wrongdoing in himself. The Mosaic laws clearly state death as a punishment for sin. So the argument that an individual must be perfect is not relevant. The God-ordained government has the responsibility for punishment. Civilized society may not depend on stoning to deter immoral crimes, but it does depend on retribution enforced by people who are themselves sinners. They do cite the legitimate textual reasons for omitting the passage, but I get the impression that the matter wouldn’t come up at all if the “liberals” weren’t using the passage. It seems likely that their main reason for omitting the passage is out of political or ideological considerations. This is simply not acceptable. You cannot rewrite the Bible to suit a particular political or social agenda. This procedure is not exegesis, studying the text to learn its meaning, but eisegesis, forcing one’s own interpretation onto the text. As it happens, the “liberals’ misunderstand the meaning of the passage. Jesus is not advocating moral relativism, but compassion in judgement. He forgives the woman for her sin, he does not say that she has not sinned and he instructs the woman to sin no more, not to go back to her life of sin. The idea is, I think, that while we should condemn the sin, the Pharisees were right to arrest the woman, under the Law of Moses, but judgement must be tempered with compassion and an acknowledgement that we too are sinners. I should add, by the way, that Jesus’s actions were in line with the rabbinical teaching of his time, especially among the Pharisees, who generally advocated a more liberal interpretation of the Law, as opposed to the Sadducees who believe in a more literal application of the Law. There have been attempts to rewrite the Bible almost since the the last books were written and the canon settled. One of the earliest such attempts was that of Marcion of Sinope who lived in the early second century AD. He believed that the Jewish God of the Old Testament was an inferior being to the God of the New Testament who was the real, universal deity. Marcion, therefore rejected the Old Testament entirely and only accepted the Gospel of Luke and ten of Paul’s letters which he edited to remove any Jewish influence. More recently, Thomas Jefferson cut out all of the portions of the Gospels which contained miracles, supernatural events, or claims that Jesus was divine. Joseph Smith not only wrote the Book of Mormon, but he “translated’ portions of the Bible to suit the needs of his new creed. The Jehovah’s Witnesses commissioned the New World Translation, which included changes in wording to support their doctrines. These revisions were all made for religious reasons by members of various sects who believed that either the contents or the existing translations of the Bible were somehow distorted or corrupted. Jefferson was not an exception. He was a Deist and a naturalist who believed that the pure message of Jesus was corrupted by succeeding generations of clergymen. In our more secular age, we have people who seek to revise the Bible to support a particular political or philosophical agenda. Thus we see the very theologically liberal scholars of the Jesus Seminar publishing a Bible that reflects their very liberal views that the Bible most Christians read is unreliable. There is a group of homosexuals who have published the Queen James Bible, in which all of the uncomplimentary references to homosexuality have been removed. And, there is the Conservative Bible Project. translation bias, mainly of the liberal kind, in converting the original language to the modern one. Experts in ancient languages are helpful in reducing the first type of error above, which is a vanishing source of error as scholarship advances understanding. English language linguists are helpful in reducing the second type of error, which also decreases due to an increasing vocabulary. But the third — and largest — source of translation error requires conservative principles to reduce and eliminate. Framework against Liberal Bias: providing a strong framework that enables a thought-for-thought translation without corruption by liberal bias. For example, the Living Bible translation has liberal evolutionary bias; the widely used NIV translation has a pro-abortion bias. Utilize Terms which better capture original intent: using powerful new conservative terms to capture better the original intent; Defective translations use the word “comrade” three times as often as “volunteer”; similarly, updating words that have a change in meaning, such as “word”, “peace”, and “miracle”. Accept the Logic of Hell: applying logic with its full force and effect, as in not denying or downplaying the very real existence of Hell or the Devil. Terms like liberal and conservative are misleading enough when applied to contemporary American politics. They have absolutely no meaning at all in terms of the politics and economics of the societies in which the books of the Bible were written. Any honest translation of the Bible into a modern language seeks to convey the meaning of the words and phrases of the original languages as closely as possible to the intended meaning of the writers, without allowing contemporary issues in politics or theology to influence the translation. Allowing such issues to influence the translation is the same as rewriting the Bible. I don’t think there is very much difference between the Queen James Bible and a Conservative Bible. I also think that attempting to translate the Bible in such a way as to support a claim of divine sanction for any human made political or social system would not only be distorting the meaning of scripture but also close to blasphemy.